On a short hike this weekend into the East Bay Hills, we came across a shallow pond harboring a lone Pacific tree frog and several amphibian egg-masses. Among the assorted jellies in the water were those of Pacific tree frogs (Hyla regilla), western toads (Bufo boreas), and California red-legged frogs (Rana draytonii). 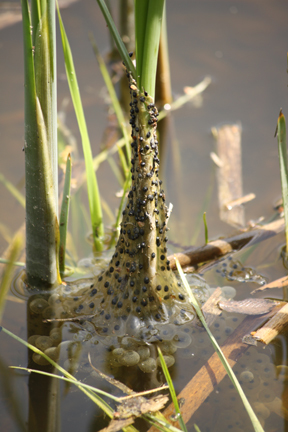 Egg-masses like these are a reliable calling card for the pond’s other inhabitants. 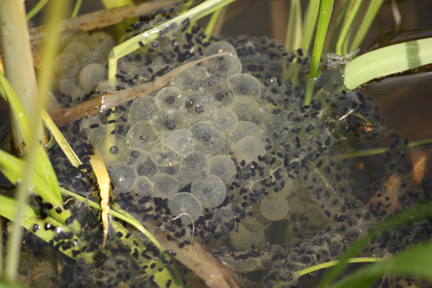 Pacific tree frog eggs are usually deposited in small, thumb-sized clusters (not pictured). Western toads leave behind jelly streamers filled with what look like little chocolate sprinkles (at a distance, these streamers always remind me of an unwound Walkman cassette tape). California red-legged frogs, however, deposit large, grape fruit-sized clusters of eggs resembling transparent tapioca pearls (like the kind you find in boba bubble teas). With the poor rainfall we’ve been experiencing, some of these eggs have a better chance of survival than others. In the topmost photo, the red-legged frog’s eggs (at center) are draped with ropes of toad eggs, all suspended loosely in the tules, free to move as the pond swells and drains into late spring. In contrast, the red-legged frog eggs in the lower photo are affixed to the tule stalk, leaving the uppermost eggs stranded in this anything-yet-but-wet-year’s dry spell.